Abby talks about choosing her major and Michigan Tech. The short answer? Vital hands-on experience through numerous opportunities. The world needs creative, critical thinkers—in journalism, film and media studies, communication and advocacy. Navigate media industries, and make your own mark. Communication, culture, and media allows you to combine critical and creative thinking with the power of technology, media, and language to advance cultural diversity and social justice in an increasingly complex globalized world. Customize your degree through a career track in film and media studies, digital media, or social media and journalism. Brainstorm, design, and produce print and digital publications. Work on client projects in CinOptics Enterprise. Getting involved with the CinOptic Communication and Media Enterprise -- a student-run business team that works to design products such as marketing materials, websites, and more for clients at Michigan Tech and around our community. 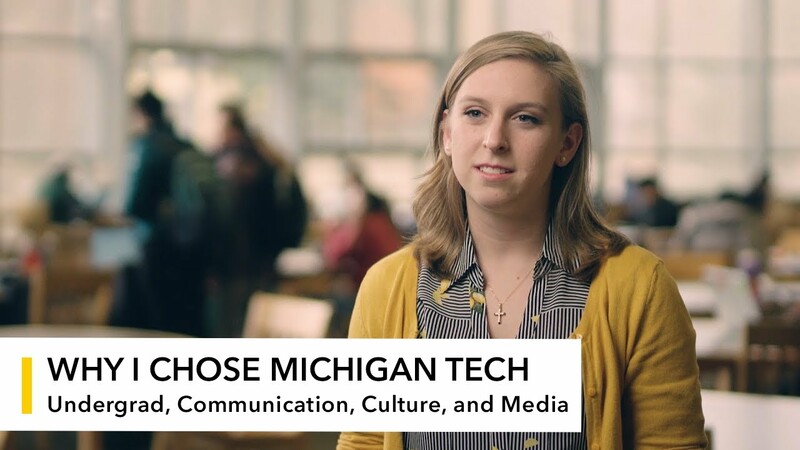 Learn more about communication, culture, and media at Michigan Tech!